The series will be written by Chris Roberson, with art by Jeffrey Moy, inked by Philip Moy. 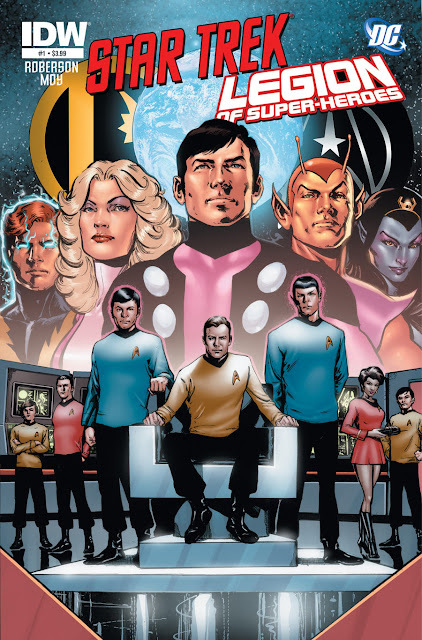 As ever there will be a variety of covers, with Phil Jimenez providing covers for the entire series, plus covers from Legion of Super-Heroes artists such as Keith Giffen, Steve Lightle, and Mike Grell, and IDW talents such as Gabriel Rodriguez. The crew of the Enterprise has returned to Earth so Kirk can give the commencement address at Starfleet Academy. Various other members of the bridge crew are beamed down to do other things, but when they materialize on the surface, it's not the Earth they know. Something has happened to history, and the universe at large, while they were dematerialized. Meanwhile, a group of Legionnaires are returning from an unseen mission in the past to the 31st century and run into an eddy in the timestream, and the time bubble they're in basically crash-lands in the 23rd century. But the 23rd century is not one they know from history, and they are immediately forced to deal with a very unfriendly population of a very changed Earth. In the altered universe they find themselves in, what's happened is that both of their histories have been obliterated by a change that's happened somewhere in the past. So the bifurcations that would have given rise to both their universes didn't happen. Elements of both their universes exist in this blended one.